I work one-on-one with creative entrepreneurs and small-business owners like you to reflect your values and attract your ideal customer through beautiful branding that matches your business. Collaborating with business owners who have a big vision they want to see realized through design is my passion and privilege. Your business has stood the test of time; your customers or clients are raving, you've just experienced or are on the verge of growth, and you're confident in what your business has to offer. When you first started, you got by with DIY or a temporary solution, but you've proven yourself time and again as a business owner, and you need your visual branding to match the value you offer. My inclusive brand-identity package is for you. You're the expert in what you do, and you're ready to partner with a design expert to elevate your business and brand. The branding package for the passionate small business includes a logo and branding that reflects your business and its values, and comes with the graphics you need to show it off, whether it's through your social media presence in a cover or profile image, the note card you send to thank your client, or the sticker you put on the package of your brownies hot out of the oven. Whether you’re in launch mode or need a personal touch for your new website, the brand starter kit includes initial brand STRATEGY and INSPIRATION board to set the design direction, a LOGO SUITE (including two layouts to work horizontally on a web header and stacked for social media), and your choice of BUSINESS CARD so you can network in style. A La Carte add-ons: Additional logo variation or mark, monogram, or brand icons; email opt-in PDF design, packaging, and collateral, custom projects. Upgrade to the Established Brand package within 6-months and apply the package price. For empire builders and established businesses, this package ensures consistency for your brand, and an intuitive design that communicates your core and connects with your audience. 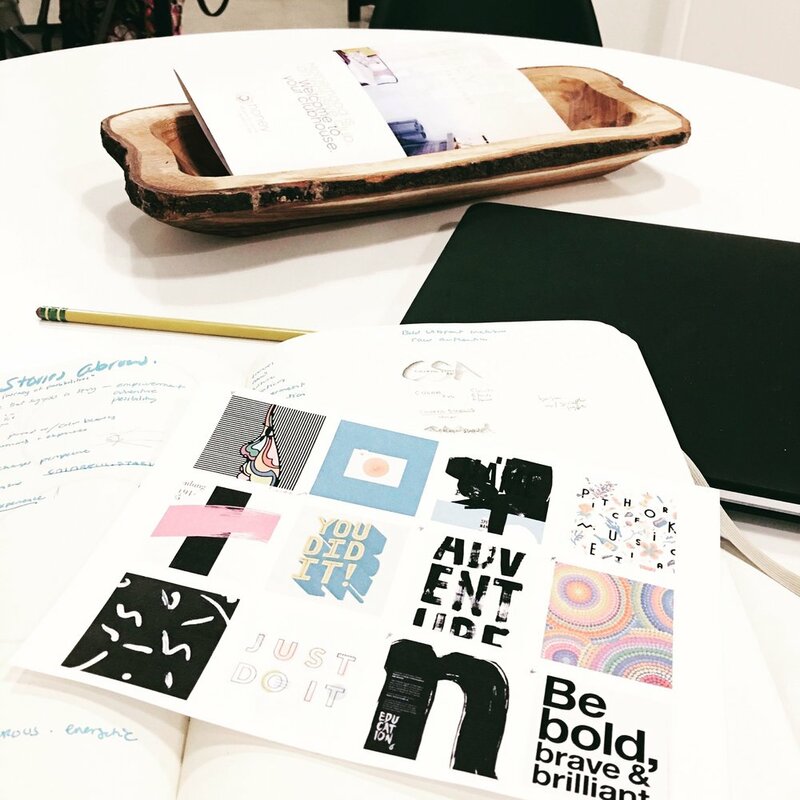 From a complete logo suite that adapts to whatever environment you need it for, to branded collateral items designed with intention, you’ll be armed with a toolkit to ensure you’re communicating effectively with your brand visuals. Custom projects, retainer packages, and a la carte add-ons available. Need something a bit simpler or more minimal in design or functionality? I'm always happy to chat and create a custom quote if it sounds like we'd be a good fit. Just click below to begin the conversation. *Choose from items like social media profile and cover images, social media templates, 1-page PDF (email opt-in or worksheet), or designs for stickers, thank you notes, etc. Based on the your business, I'll include a list of possible items to choose from, and we can select the best choice for you together. If you need more than one item designed, a-la-carte items are available. A logo suite gives you consistency paired with versatility. Instead of just creating one static logo that must fit multiple platforms, your logo will be comprised of a system of type, imagery, and compositional elements based on your brand's needs so that you'll have multiple options depending on context, format, and fit. With Nikkita.Co you're not just a cog in a giant machine. I limit the amount projects I take on at a time so that my focus can be on you and your design vision. The bulk of the magic happens in the discovery phase: where I research, sketch, and explore mulitple design solutions before I present you with your concepts. I dedicate this time to digging deep into your business's core to learn who we need to reach and the best way to do that. During our work together, I'll create an inspiration board to set the visual tone for the design, and to serve you later when you're stuck. You'll also get a brand style sheet that includes all your logo and custom design elements, brand typography, and color palette—all in one place for you to reference and implement into your business documents and marketing. All of your files will be clearly labeled and organized for both print and web, so you'll always have the exact file you need for the task at hand. Your visual branding doesn't end with a logo. I intentionally offer my designs as a comprehensive package so that you'll have the items you need most to make an impact for your business. Choose from business card design, stickers and packaging, signage and banners, social media templates, and more. In addition to the two items included in your package, you can purchase more a la carte. Working with me, you can feel confident that I'll have your back going forward. As your business grows, I'll be available to design additional collateral to fit your needs. The items in my portfolio include details about the design process and my work with each client, so you get a better idea of how a business's values come into play with branding and can view more than just the end result. Collaborating with me is not just about a polished logo or end product—it's about the work we do together along the way to bring your core values out visually and keep your passion at the forefront. I follow a clear process from start to finish so that we’ll both always know what we need from one another, and what’s left to complete. You'll start by telling me about your business, and I spend time reseaching, sketching, and exploring based on your needs and your ideal customer or client. We'll work together to refine the ideal design solution for you, and you'll recieve all the files packaged for print and web, along with brand guidelines to help you confidently implement it in your marketing and print materials. A timeline specific to your project will be created and sent in your welcome package once you book my services. In general, with timely feedback branding packages take 3-6 weeks to complete, depending on collateral items and a la carte items. Fill out the project form by clicking below so I can learn more about your project and I’ll send you a link to my intro page with detailed information about my services, process, and booking information.